I spent Monday and Tuesday shadowing the York Dispatch‘s two staff photographers. Monday was a series of wild-goose chases — checking this out, looking for features… you know, the typical newspaper photography experience. Tuesday morning, a fire destroyed two homes in nearby Red Lion. It was later ruled as arson, and John and I were sent to follow up on it in the afternoon. Three men were on-site, boarding up windows of the duplex that housed two families. I figured out that two of them were hired by one family to cover up one side of the duplex, and the other was hired by the other family. So John followed the two men, while I followed the single one. © 2011 by The York Dispatch. 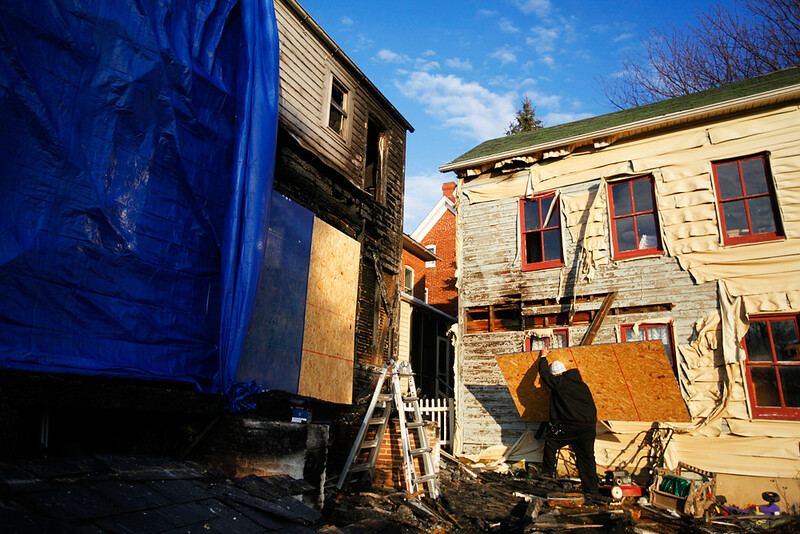 Blake Cooper hauls a piece of plywood to board up a lower-story window of 136 W. High Street in Red Lion on Tuesday, Jan. 4, 2011. Cooper, who works for Major Restoration Services, said the fire damage at this duplex was among the worst he has seen. In such a disastrous scene, there were beautiful colors and beautiful light. I did my best with both. © 2011 by The York Dispatch. 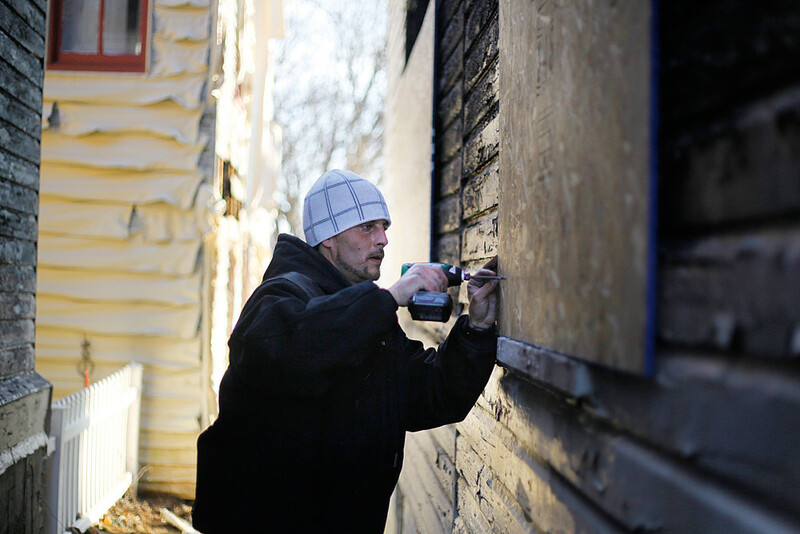 Blake Cooper screws in a piece of plywood to board up a lower-story window of 136 W. High Street in Red Lion on Tuesday, Jan. 4, 2011. The fire, which was called shortly after midnight Tuesday and was later ruled as arson, was caused by trash bags filled with gas that were thrown onto the porch of 136 W. High Street and ignited. Coming up next: high school basketball!